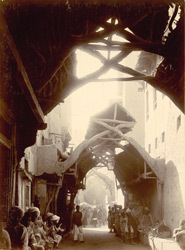 bl.uk > Online Gallery Home	> Online exhibitions	> Asia, Pacific and Africa Collections	> Covered bazaar at Shikarpur. Photograph of the bazaar street at Shikarpur in the Sindh province now in Pakistan, taken by an unknown photographer in the 1890s. The mud daub roof, supported on a wooden framework, is largely collapsed. The historic town of Shikarpur, founded in the 17th century, was once an important trading centre. Due to its strategic location on the caravan routes of the 17th century, Shikarpur became the greatest commercial city in Sindh, Pakistan. Its merchants and bankers held commercial relations with all the principal markets of Central Asia, including Khorasan, Bukhara and Samarkand. Commercial cities of the Muslim world were known for their central covered bazaars and Shikarpur was no exception, its bazaar, lined with shops mostly run by Hindu merchants, ran through the centre of the old city, which is now much decayed. The Persian ruler Nadir Shah (1688-1747) is said to have stayed in Shikarpur on his march through Sindh while returning from invading India in 1739. This photograph is from an album of 91 prints apparently compiled by P. J. Corbett, a PWD engineer involved in irrigation work at the famine relief camp at Shetpal Tank in 1897, and in canal construction in Sindh in the early 1900s.